I've had the Hero Arts Color Layering Ice Cream set for a few months now and finally used it. It's one of my favorite sets in the Summer Catalog. I decided to focus on the sentiment and try and create a cone that is melting. Die cut watercolor paper with a stitched scalloped rectangle die (from Waltzingmouse). 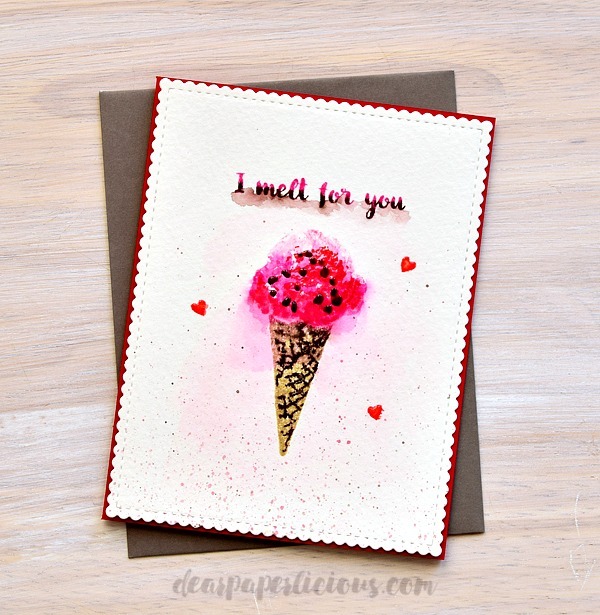 Stamp the solid ice cream scoop stamp on watercolor paper using a Tombow light pink marker. Using a marker on a solid stamp guarantees a blotchy result and that is what I wanted. Stamp the solid ice cream scoop again using Ranger Distress Picked Raspberry ink on just the bottom of the scoop. Lightly watercolor the scoop, blurring the edges and pulling down some of the color to mimic melting. Let dry and make believe you have a clue. Stamp the top layer of the scoop one more time with Ranger Distress Barn Door ink. Mask the scoop and stamp the solid cone with Hero Arts Soft Brown ink. Stamp the chips with a Chocolate Chip Stampin Up marker. Stamp the sentiment with the light pink Tombow marker and again using the Chocolate Chip marker on just the bottom of the sentiment (used the MISTI to get this aligned). 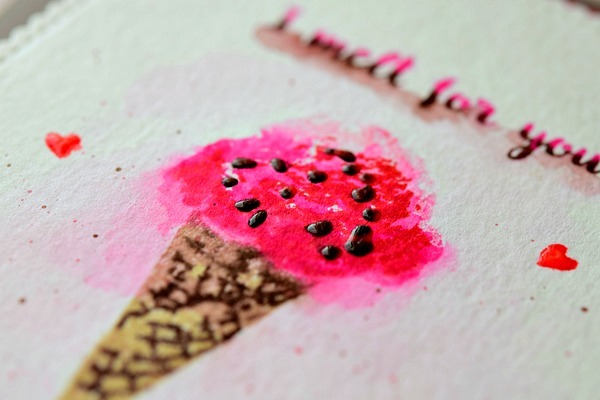 Lightly watercolored the sentiment and pull down some pink from the scoop onto the cone. Stamp the hearts from the set with Ranger Distress Barn Door ink and slightly watercolored. 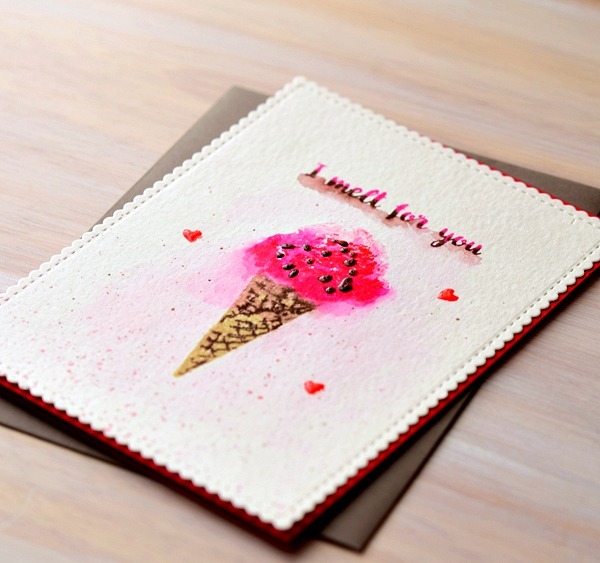 Speckle the card (masking from above the cone) with Picked Raspberry and Chocolate Chip. Add Clear Pico Embellisher to the chips and hearts. Let dry and adhere to a red card. MOOD WHEN DONE = Hmm...ice cream. And where is my large water mister bottle? This thing holds about 2 cups of water and has vanished from my craft room. I use it all the time! I had to remove all my supplies in order for the ceiling to be painted. Last time I saw the mister was after I had moved everything back. I used it to clean my craft table so I know it's here somewhere. I know you lose stuff all the time, so any ideas?? All I know is that if I look and look and look and give up finding it and buy a new whatever-it-is-that-is-lost, the old one will turn up immediately after the time for returning the new one has expired! PS: Love the card . . . my willpower regarding buying a MISTI is weakening. Hey, I'm commenting right after another commenter from Reno! Of course, maybe it's not the same Reno! Anyway, I love your ice cream cone - looks good enough to eat & the sentiment is perfect. Have you found the right orange ink yet? Thanks so much. Thanks. I think I will buy the Lawn Fawn carrot the next time I place an order with Ellen Hutson, which will probably be in July. I hope that will be a true orange. LOVE LOVE LOVE this card!! You did an awesome job with your melting ice cream. You inspire me! I put my keys in a VERY safe place about a month ago --- haven't found them yet. So flippin COOL, Joan!! The chocolate drops were a brilliant addition to your cone! I absolutely LOVE every little thing about this card!!! I love this card! You can totally taste the icecream! Love the mix of markers and distress ink, such a gorgeous result!